The background of an uninhabited Caribbean island. From Belize to Honduras, Nicaragua and Panama, the environmentally friendly Polar Star expedition vessel churned through the Caribbean Sea, then passed through the historic Panama Canal to the Pacific Ocean and on to Ecuador and Peru, encountering fascinating wildlife on land, at sea and in the air, while exploring isolated islands, coral reefs, jungles, small villages, research projects and ancient ruins. 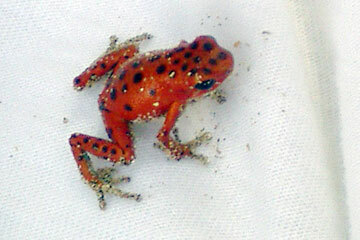 A red poison-arrow frog appeared at a Panama beach. A viringo, Peru's ancient hairless dog, lounged at the Huaca de la Luna, the Pyramid of the Moon. 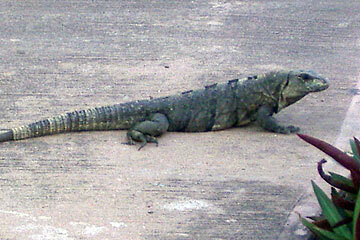 A crocodile hoped for a snack in Belize. 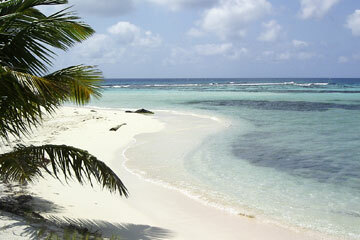 The Polar Star is anchored off Big Corn Island, Nicaragua. The sea surrounding the ship is sparkling in the early-morning light as if a benevolent sea god had spent the night sprinkling diamonds across its surface. Owner Karlsen Shipping Company's brochure says the Polar Star is an ice-class vessel certified for international voyages that complies with all safety and environmental regulations. Martin Karlsen, president, is quoted as saying, "As guests in the natural environment, our care and respect for the wildlife, oceans, land and atmosphere are essential to ensure preservation and protection now and in the future." Based on what I saw and experienced, every staff member subscribes to that policy. I joined the "Tropics of the Americas" expedition. Among 16 other voyages offered are "Passage of the Condor," "Realm of the Polar Bear," "Essence of the Azores" and "The Great Antarctic Expedition." You can book a tour directly or through a travel agent. A Zodiac was sent to fetch Nicaraguan authorities, and once we are cleared, we'll head to Little Corn Island for a day of exploration. The ship has to anchor a few miles out to avoid shallow water so Zodiacs are the only way to get to shore. As they bound over the waves, we hold onto a rope that is secured around the outside. The boats, designed for safety, are inflated in seven parts and are capable of staying afloat as long as one of those parts is inflated. By now we are experts at boarding Zodiacs. We stop in the wet room to don life jackets, wait for the boats to be lowered and brought alongside the gangplank, then step onto the pontoon and into the craft, using the sailor's grip, holding hand over arm with a helper. As we leave the ship, someone checks us out, then checks us back in when we return to ensure no one gets left behind. My expedition started in tiny, tropical Belize. I was nearly knocked out by the sweltering heat, with humidity so high it seemed that invisible rain was drenching my body and clothing. Breathing was difficult. Mosquitoes were plentiful. At a jungle-like zoo we saw the friendly tapir and the stunning keel-billed toucan, the national animal and bird, in a natural habitat, amid trees, flowers, vines, narrow paths and rustic structures. A cute raccoon was following me around. 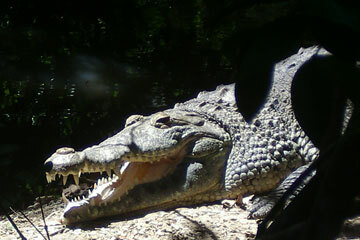 A crocodile was lying with its mouth open, in case something edible dropped in. 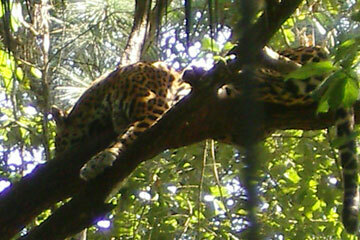 Jaguars were snoozing in the trees. Monkeys were swinging limb to limb. When time drew near to catch a boat to the ship, two 2-foot-long iguanas, looking like oversized geckos, kept us amused near the dock. The Polar Star was waiting about 10 minutes away. It was a splendid sight, with its polar-bear logo and its store of 10 Zodiacs in a double row above the fifth deck. A polar bear? In the tropical Caribbean Sea? It turns out the ship was originally an icebreaker with the Swedish Navy but was rebuilt for expedition use. It was flying the flag of Barbados, the country of its registry, although the company was founded by a Norwegian and is based in Nova Scotia. Surely the ship would offer relief from the heat, but no, it was even hotter than Belize. It spends most of its time in the Arctic and in Antarctica so the heater probably worked, but not the air conditioning. I was glad to find a fan in a closet. Chan Chan, the largest adobe city in the world, was the capital of the Chimu kingdom, which thrived from A.D. 850 until 1470, when it was conquered by the Incas. 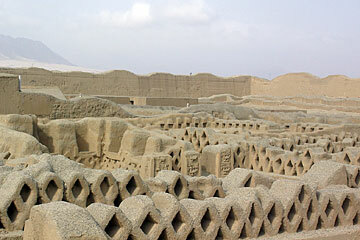 The vast ruins are located outside Trujillo, Peru. My cabin on the fourth deck had two big windows, two bunks, a desk, chair, night stand and bathroom. I tried to escape the heat by taking a cold shower, but it was programmed for polar regions. The water on the cold side was hot and on the hot side, it was boiling. I got out fast and stood in front of the fan. All 43 passengers gathered for a briefing on Deck 5, the observation deck, a cool oasis in a desert of oppressive heat. Surrounded by huge windows, it was the perfect spot for the lectures and documentaries we would have throughout the trip. We met the Polish captain and the staff, an impressive group of experts in many fields, with each person having at least two specialties: marine biology, geology, ships, tides, reefs, sea life, climates, animals, astronomy and birds. At the bar on the observation deck, a platter of fruit, cheese, cookies or cake was set out each afternoon, but it was the half-price drinks at 5:30 that drew a crowd. Doors led to the stern's open deck, a favorite haunt each evening for sunset addicts. On the first evening, the sun dropped into the water as one intense, fiery ball, keeping all its radiance and sharing none of it with the clouds. The food was healthy, delicious and beautifully presented. At breakfast, we had lots of fruit, an array of cereals, eggs, bacon, and croissants, and surprises such as pancakes, beans, banana bread or fried potatoes. Lunch was often laid out buffet style. Dinner included vegetarian soup, such as squash, gazpacho, asparagus or minestrone, but never the same type twice. The appetizer might be stuffed mussels or salmon with cream cheese and capers or salad, and meat, fish and vegetarian entrees were offered each night. The chef delighted in making attractive, sometimes mysterious desserts, and artistic fruit carvings, and, always a polar bear carved out of a chunk of cheese. For long days ashore, we took along a sandwich, cookies, fruit and bottled water. Having no door key took some getting used to, but after a while, I appreciated the freedom from keys and the fact that our utopia was crime free. We had no phones, TV sets or newspapers, but a satellite news report was posted daily, and each night, a notice was left on each cabin door, outlining the next day's plans. The library, just below the bridge, was a perfect place to spend down time. It was well-stocked with books and plush furniture and was by far the coolest place on the ship. Tap water was drinkable, but not my cabin's polar hot water, so I filled my water bottles on the observation deck. The crew said drinkable water can be made from sea water, using reverse osmosis, a process that uses so much energy that they simply buy water. After an exploration of Cocorocuma Island, off the Mosquito Coast of Honduras, a Zodiac returned us to the Polar Star. OUR FIRST EXPEDITION was to one of many spotless, white-sand beaches on an island inhabited only by seabirds. The water appeared calm but we had bumpy Zodiac rides, slamming into small waves and bouncing high. Snorkelers headed to the reef to see the brilliant fish and colorful coral; swimmers dove right in and explorers tromped around the island. In spite of insect repellent, everyone got bitten by what we were told were sand flies. We never saw them, just the itchy reminders that they had, indeed, seen us. After several excursions in Belizean waters, we headed to Honduras. We explored Utila Island and its iguana conservation project. Iguanas have to leave the mangroves to lay eggs, which would rot in the water, so nesting boxes are built to keep them from making predator-vulnerable nests in the sand. Eggs are then moved to incubators. The project housed several types of iguanas, which look like miniature dinosaurs, but it seemed the project was also raising mosquitoes, which were thick in the air. Insect-eating birds were chasing them, while hummingbirds gathered around the flowers. We went to isolated islands, such as Barbareta, which could well have been in Hawaii, with its clear turquoise water, white sand beaches, prolific palm trees and other tropical vegetation. Among the inhabited islands was Bonacca, a fisherman's village with brightly colored houses on stilts and many small boats. Hammocks hung inside and out. Small shops lined the narrow streets and alleys but having landed on a holiday, they were all closed. When we reboarded the Zodiac, our knowledgeable driver Gary asked if we wanted to explore the shipwrecks. So we spent an hour cruising in nooks and crannies, amid ruins left by Hurricane Mitch eight years ago. 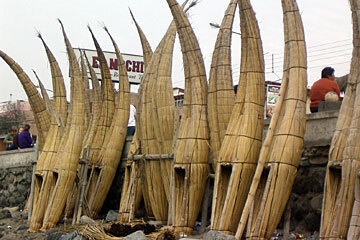 Reed fishing boats, used from the time of the Moche and Chimu cultures, are a familiar sight at Huanchaco in Peru, whether drying on the beach, or in the ocean, laden with fishing nets. We anchored off the Mosquito Coast to explore Cocorocuma, another lush island surrounded by a coral reef, and later, while heading to Nicaragua, we listened to a series of lectures on subjects such as plate tectonics, the ring of fire, and life in the sea. Each evening, we were treated to a recap of the day's activities, and question-and-answer sessions with staffers. I showed one, Santiago, my photos of tiny birds clinging to one of the ship's windows for a breather. One was a barn swallow and one a warbler. He said they looked healthy, but he had found some dead birds on deck and some too weak to continue. He said they're insect eaters but even if offered insects, they wouldn't eat them unless they caught them. These tiny, fragile birds are victims of internal computers that force them to undergo perilous migrations every year. Finally we arrived at Little Corn Island. We split into swimmers and hikers. I was eager to explore the jungle. A naturalist joined our small group and an armed Nicaraguan police officer abruptly appeared and hiked with us. He was friendly, but I was unsure who he was protecting from what. The naturalist had big leaves in his hat, which he said were noni leaves that kept his head cool. He picked some for my hat and maybe it was the power of suggestion, but I immediately felt cooler. He eventually supplied everyone with this jungle air conditioning. 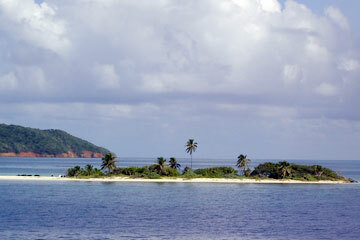 The expedition ship stopped off this isolated island in Belizean waters, where we swam, snorkeled and explored. The narrow trail went straight up but finally leveled. Swampland lay a few feet off the trail. We saw lovely birds, tropical trees, fruits and flowers. We ended up in a fishing village, where they haul in crab and lobster. There were no cars, just a few bikes, and small fishing boats along the shore. A narrow sidewalk wound through the village. We could see the ship, which seemed to be suspended in space, standing vigil over its wards. The days ran together, although each was unique. Just as each sunset was unique. The last one seemed to be spread over half the sky at the horizon. The sun itself wasn't visible, just its rays, which were poking through the clouds and sending off glorious patterns. Soon we were off for Panama, skimming the water's surface and leaving a tiny wake. When we arrived off Bocas del Toro, we got off the Zodiacs and boarded motorboats. We crossed Dolphin Bay, an enchanted place where dolphins flew out of the water and circled the boat and seemed to appreciate the awe they inspired. We went to the edges of the bay to the mangroves and saw oysters clinging to the roots. The naturalist picked up a large, non-stinging jellyfish for us to see, then gently put it back into the water, doing the same with a starfish. After an hour, we landed on Popa Island, where 250 Ngobe Indians live in thatch-roof dwellings on stilts, amid dogs, turkeys and chickens. Fifty of the residents are kids and a few of them did simple dances in an open pavilion. The women make bead jewelry and woven bags and I bought some, wanting to leave some money in that friendly village. 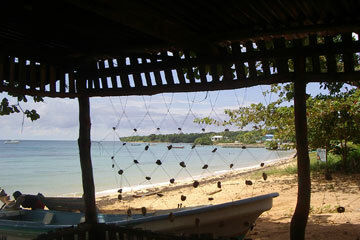 Later, we crossed the bay to Playa Pristina beach, reachable only by a narrow jungle trail, isolated except for a bar, which had swings instead of stools. It was right out of a South-Seas travel brochure, with a wide white, winding beach, gentle waves, clear water, coconut palms and flowers. People were drawn to the water, but our mission was to find the red poison-arrow frogs. We finally found one of the tiny creatures, near a parade of big leaf-cutter ants, carrying chunks of leaves underground to process. On Little Corn Island, Nicaragua, after a strenuous hike in the jungle, we walked through the quiet fishing village amid many small boats. BEFORE ARRIVING in Panama, we watched a film about the difficult, deadly, decades-long task of building the Panama Canal, through which the first ship passed in 1914, and which was turned over to Panama in 1999. We docked at Colon and set out for Galeta Marine Research Station, where reefs, sea grass and mangroves are studied. On the way, we saw a three-toed sloth hanging from a tree branch. Later, we watched cruise ships, freighters, military vessels and smaller ships passing through the canal at Gatun Locks. The highest point at Lake Gatun is 85 feet above sea level. The water raises and drops in the locks as each ship is carried from the Atlantic Ocean to the Pacific Ocean. We had a buffet dinner on deck that evening and watched part of the process of our ship crossing the canal. It took eight hours to go the 50 miles. We knew we had hit the open Pacific when the ship began lurching early in the morning. Ocean conditions thwarted our jungle trek in Panama's Darien region, one of the world's most impenetrable wildernesses. Our scouts looked for a place to land but found a forbidding coastline of volcanic boulders, low tide and high waves. A few of us explored by Zodiac. I hoped to get a glimpse of monkeys and coatis but saw only thick jungle growth in scores of shades of green, including hundreds of species of trees, kapok and baobab trees among them. Suddenly a hawk swooped from its high perch and grabbed an egret on a lower ledge, in a movement as swift as lightning. We saw one rustic abode with a canoe in the yard, probably a family of Embera Indians. Back on the ship, we saw boobies, flying with style and grace but landing hard on the water, like inexperienced pilots. The ship was pitching and swaying and the decks were wet and slippery. We were told to secure our belongings and to hold onto the railings because weather conditions would be bad for a couple of days. In a fitting lecture, Pierre, a burly, bearded, but soft-spoken man from South Africa, talked about El Niño conditions -- which occur more frequently with global warming -- that are killing off many species, and how human folly is causing irreparable environmental damage. Soon, we were off the coast of Colombia, but we stayed in international waters, 12 miles from shore. We were nearing the equator so all polliwogs -- those who had not crossed the equator by sea -- had to get permission from King Neptune to cross. A number of brave souls took part in a hilarious ceremony, with staffers dressed as King Neptune, his mate, the royal baby and ugly mermaids in wigs and flippers. They squirted us with dark liquids, broke eggs over our heads as we kneeled at the king's feet to ask permission to cross his equator, then sprayed us with something like yellow glue. Afterward, a crewman hosed us down and we went dripping to our cabins. But a reward awaited: When I got back on deck, a call came from the bridge, "a pod of dolphins off starboard," so I ran up outside stairs to reach the bridge for a 360-degree view. There were about 10 of them, leaping wildly through the air, and it was a magical moment, like a gift from King Neptune. 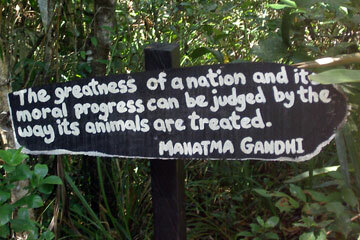 A fitting sign was posted in a jungle setting in Belize. SOON WE WERE in Ecuador. Told we'd have a wet landing, we took off our shoes and jumped off the Zodiacs into knee-deep water. Several little boys had an ingenious business. Using three small plastic chairs, pitchers of water and towels, they washed off the sand and dried our feet. Men were selling items carved from the tagua nut, whose flesh is ivory colored, along with Panama hats. Knowing that authentic Panama hats are indeed made in Ecuador, several people bought good-quality hats for $10. In the village of Agua Branca in Machalilla National Park, we saw excavated funeral pots amid pigs, goats, dogs and chickens, then walked over rough trails, some with ladders made of twigs. Some hills had boards stuck in the ground for traction. Dust was flying everywhere. Rainy season comes in December but villagers said they've had little rain for years. A few locals played in the thermal pools and put mud from the bottom on their faces, while iguanas lurked in the overhanging trees. After a long exploration, we were off to isolated Los Frailes Beach. I walked a long trail to a lookout point for an amazing view of infinite shoreline. The long day was capped by a visit to the village of Puerto Lopez and some Ecuadorian beer. I ended up on the last Zodiac back to the ship at nearly sunset. 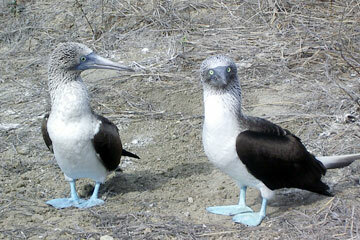 Ecuador's highlight was Isla de la Plata, 28 miles off the coast, a seabird sanctuary likened to the Galapagos. After a nearly vertical one-mile walk, we were panting, but it was the blue-footed boobies at the top that took my breath away. The shade of blue, unlike any I've seen in nature, looks like spray paint. Pairs had claimed little territories and clearly marked them. Some were sitting on eggs; others were chattering and mapping out the household. One pair fussed over its baby: a fluffy, snow-white creature nearly as big as the parents. One went to get it some food while the other stood watch. There were about a dozen couples and most seemed oblivious to our presence, but the pair with the baby had laid claim to the center of the trail so we had to carefully walk around them. Nevertheless, they had a few things to say to us. We went to the edge of the cliffs to Punta Machete to watch the ocean rushing up against the rocks and the large frigate birds with their forked tails flying overhead. But I had to see the boobies again. By then, one had returned with food for the baby. They plod about like penguins but are graceful in the air. I reluctantly left them and went back down to the shore where watermelon, pineapple, banana bread and mango juice awaited. Blue-footed boobies charmed us on Isla de la Plata, Ecuador. 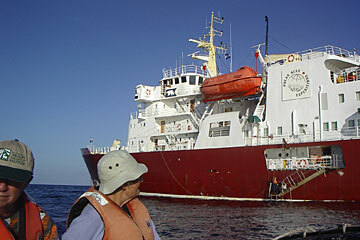 We were in the rich feeding grounds of the Humboldt current and watching for whales. When urgent calls from the bridge would say, "whales off port side," we would race to the upper decks to gasp in awe at the gigantic whales breaching and spouting. Ocean swells threatened to close Peru's Salaverry port, but it opened and we rode a bus to Trujillo's town square, but the town was closed. Another holiday. We headed to the Moche pyramids, passing dusty adobe homes, stores and walls, all of which seemed to be carved out of the earth. We saw the extensive ruins of Huaca del Sol and Huaca de la Luna, which were the site of much ceremony, sacrificing and drinking of blood in the days of the Moche culture, dating to B.C. 100. 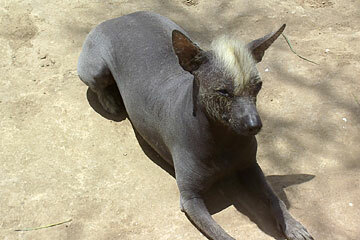 After seeing the viringo, Peru's famous hairless dog, depicted as blue in murals in the ruins, I went crazy over the real ones, which indeed look dark blue in the sunlight, with their only hair a blond tuft on top of their heads, looking like a mohawk haircut. We walked for hours in the maze of Chan Chan, the ruins of the largest adobe city in the world, which was the capital of the Chimu Kingdom, going back to A.D. 850. In Huanchaco, we watched a mariachi-type band and costumed dancers before heading to the beach to see reed fishing boats, in use since the time of the Moche and Chimu. The reed version of kayaks were standing on end, like surfboards. It did not seem possible to keep one afloat, but we saw a fisherman heading out, expertly surfing the waves with fishing nets spilling out of the tiny boat. We set sail during dinner, and were at sea all the next day. A pod of whales showed up as if to bid us goodbye. We would dock the next morning at Callao and go into Lima by bus, so the city awaited, but the magical voyage on the shining Polar Star was coming to an end. 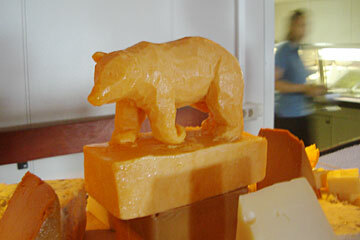 The chef carved amazing birds and animals from fruit, but always carved the polar bears from huge chunks of cheese. As if air travel isn't bad enough these days, try adding a couple of earthquakes and their repercussions to the mix. It was 6:45 a.m. I was ready to go to the Hilo airport to start my journey to Belize, but my taxi didn't show up. Then the 6.7 earthquake hit, followed by a 5.8 aftershock. I couldn't contact a taxi so I hired a stranger to take me to the airport. An hour later, the agent said the plane couldn't come in from Honolulu and they were moving me to another airline. Soon I was on a plane, feeling pretty smug because I had used up only one hour of my four-hour Honolulu layover. My mood changed when I arrived at the dark Honolulu airport. I had run smack into a power outage. No agents, no monitors, no lights. A janitor suggested a shuttle to the international terminal. Nobody there, either. I walked about a mile before finding an agent, who got me my gate number. Once there, I waited. Hours passed. People got hungry and thirsty but vending machines and water fountains didn't work and the faraway snack bar had long since run out of food. Also the automatic sensors on the toilets didn't work so the bathrooms were a mess. I saw crew members. They knew nothing except that the plane at the gate had passengers on it who had been waiting three hours for portable stairs to let them off. Finally, I saw stairs being pushed up to the cockpit. The people got off. Cleaning crews got on. Still no agents. After a 10-hour outage, the lights came on. Hooray. Everyone clapped. I had been calling connecting airlines to tell them I was missing their flights and trying to find a new way to get to Belize. Each agent gave me different information and different prices. I would have to wait until I got to Los Angeles. 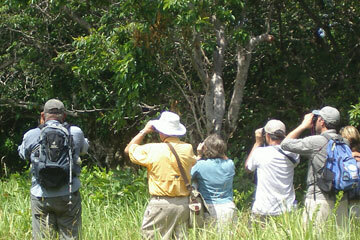 On Little Corn Island, Nicaragua, we watched birds. At last, we boarded. The chutes still weren't working and it was raining. We went down one set of stairs, across the tarmac and up another set. We sat on the plane for an hour. The pilot said we were waiting for a piece of paper before we could leave. Then the flight attendants spent the first hour selling DVD rentals and candy before serving dinner. We were ready to riot. In L.A., I asked the agent to retrieve my bag so I could recheck it when I found a new way to Belize. It turned out it wasn't on board. I filled out forms. An hour passed. I stood in line for an hour and a half at American Airlines but found a wonderful agent, who got me on a flight to Dallas and said he would send a message to Honolulu to look for my bag. The flight was ready to board and I still had two security checkpoints and a long walk. I nearly missed it. After a few hours in Dallas, I got a flight to Miami and another to Belize. I arrived in Belize after 30 hours. I filled out more forms for my lost bag. I had my backpack, but except for one change of clothes, it was full of nonwearable items. Expedition mates were donating toiletries and offering me clothes. Three days later, the bag showed up. I was ecstatic. 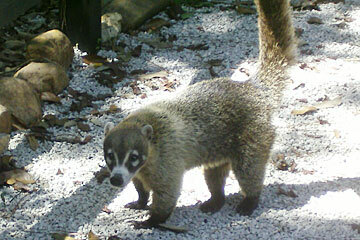 In Belize, I made friends with a sweet raccoon. I then had a magnificent expedition, far from airports and planes. But weeks later, in Peru, when I tried to check my bag from Lima through to Hilo via ATA, they said the flight had been canceled. They checked the bag to Miami, where I went through customs, then rechecked it to L.A. In Miami, I spent an hour on the phone, getting conflicting information on the status of my flight out of Los Angeles. It turned out that it had indeed been canceled and they were to find me a new way home, but the supervisor couldn't seem to read airline schedules so I said just refund my money and I'll find my own way home. I was in the American Airlines terminal so I went to an agent for help. She said there were no seats, but then she found an $800 seat, and finally some weird deal where I could buy a round-trip ticket for $299 and throw away the return portion. When I arrived at the Honolulu airport, 32 hours had elapsed and interisland flights had stopped for the night so I had to stay in an airport hotel. I was relieved to get home the next day and find no earthquake damage. Such an experience might make anyone but a diehard give up. But my brain is wired for travel so I'm optimistically planning my next trip. A day ended somewhere off the coast of Colombia. 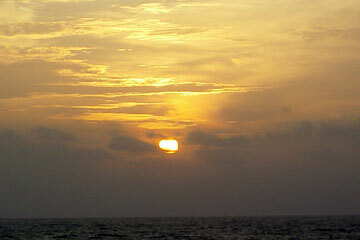 The sunsets at sea were a sight to behold, each with its own personality. Charlotte Phillips is a former copy editor for the Star-Bulletin who is enjoying seeing the world.